One of the important jobs we have as concept artists is marrying form with function. A design should look like what it does, right? However, there can be many different design approaches to solve any one specific function. 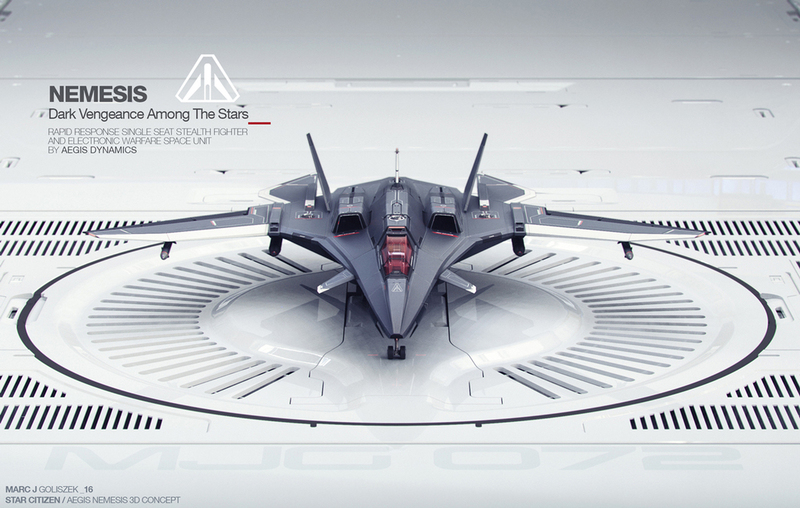 In the game Star Citizen, concept artist Gurmukh Bhasin points out that the Star Citizen universe includes several different manufactures each with their own aesthetics of design. There is Roberts Space Industries, Aegis Dynamics, Anvil Aerospace and more. His job, when designing, is to make sure he stays within the form language of that manufacture as well as convey a sense of what that ship is all about. So, one of the key things Gurmukh does is to write a little blurb about how the new ship will fit into the Star Citizen universe and what it’s “attitude” is. This is a small step but it makes a huge difference in being able to come up with ideas and designs that really fit the bill. In his class, for example, Gurmukh assigned them to create a new ship from the Aegis Dynamic manufacture called Nemesis, a single-seater, light fighter and a brother to the well-known Gladius. “The Nemesis is an annoying bee as it is hard to hit, as it bobs and weaves quickly but like the Gladius, is able to cause damage to ships way above its weight with 2 wing mounted guns and a built-in custom Gatling gun. Basically, this ship is meant for combat. It trades heavy armor and extra fuel for its ability to make turns on a dime and outrun the enemy. You definitely want a Nemesis or two causing distraction and being a pest while in a space battle." In that brief, even though small, are many of the elements that will influence the design. It's going to influence everything from the thickness of the wings to the overall shape of the ship. It was more than enough for Gurmukh’s student Marc Goliszek to get started on his own designs and brief. Marc’s description below shows you how, over the course of ten weeks, he fleshed out the design and the description of this new ship but it is important to keep in mind that a detailed description like this is not a starting point. It’s an end point. As with most design ideas, it is important to keep it rough and simple in the beginning. Gurmukh Bhasin’s idea that the Nemesis is “an annoying bee” really sets it all in motion. Nemesis: "Dark Vengeance Among The Stars"
Rapid response single seat stealth fighter and electronic warfare space unit developed by Aegis Dynamics. The Nemesis’ sheer ability to operate both planetside and in the deeper reaches of space, whilst boasting cutting edge stealth and never before implemented exo-planetary engine propulsion, matched with a powerful loadout option range ideally fit to your mission needs, all come together to create a new foe to be reckoned with on the battlefields of our galaxy. Quickly explore uncharted exoplanets, conduct recon and stealth missions without anyone ever realizing you were there in the first place, or tackle and disrupt your enemies before they know what hit them.